Mason had spared no expense. In his position, there was no need to. For the past decade, he had run his own private equities-and-lending firm, and business was good. He had all the money in the world. But of course, wealth had its limits. He couldn’t buy his mother her mobility. He couldn’t buy a way to make her smile again. He took a deep breath of the morning air. “It’s sweet,” he said. “Your cousin Greg sent a crew to take care of the mowing and gardening,” she said, nodding in the direction of a long swath of grass sloping down to the water’s edge. There was a dock and a timber-and-stone boathouse, home to kayaks, a catboat and a 1940s Chris-Craft. When not on duty at the fire station, Adam lived in the upstairs quarters. A fringe of ancient willow trees dipped their budding branches into the placid, sunlit water. The word that came immediately to mind was unspoiled. Willow Lake was one of the prettiest lakes in a landscape full of pretty lakes. The green-clad hills, with a few puffy clouds riding on their shoulders, rose gently upward from the shore. On the north end of the lake was a grand old summer camp, a hundred years in the making—Camp Kioga. At the south end was the town called Avalon, as picture-perfect as a storybook setting, with its whistle-stop train station, old-fashioned town square, stone-built Greek revival library and shady shoreline parks. Its outskirts were equally attractive—a mountain road leading to a ski resort, a ball field for the local bush league baseball team, white-steepled churches, their spires seeming to thrust through the new-leafed trees. The cliffs of the Shawangunks attracted climbers from all over the world. Somewhere not so far away, there was probably suburban blight—shotgun shacks and mobile homes, ramshackle farms and big-box stores. But he couldn’t see any of that from here. And more important, neither could his mother. The place he’d acquired for her was on the western shore of the lake, so it caught the sunrise every morning, something his real-estate agent had pointed out when he had bought the property. The agent had babbled on about the attributes of the historic mansion, not knowing Mason was already sold on getting the place. He was looking for security for his mother, not for a return on investment. Now he understood why they all quit. “Where should I put your things, Mr. Bellamy?” asked the housekeeper. Mason stood glaring out the window at an impossibly serene and beautiful view of Willow Lake. Although he’d arrived late the day before, his luggage had been delayed—some mix-up at an airport between here and New Zealand. Now Mrs. Armentrout rolled the two large bags into the room. The suitcases wore tags marked Unattended Baggage. He hadn’t seen the luggage since dashing to the airport in New Zealand after getting the call about his mother’s accident. Now he realized he didn’t need the bags at all, since they were packed with winter clothes. “Right there is fine, thanks,” he said. The housekeeper worked with brisk efficiency, hanging his bespoke suit in the antique armoire, carefully folding cashmere sweaters away in a cedar-lined drawer. She lifted a dress shirt out of the suitcase and put it on a wooden hanger, her hand moving appreciatively over the fabric. Philomina Armentrout actually looked more like a supermodel than a housekeeper. A native of South Africa, she was tall and slender, with creamy café au lait skin, wearing chic black slacks and a white blouse, shining dark hair and subtle makeup. Only the closest of inspections would reveal the tiny scars where the jaw wires had been surgically anchored after her husband had assaulted her. Mason had committed himself and all his resources to staffing the household with the best personnel available, and Mrs. Armentrout was definitely the best. That wasn’t the only reason Mason had hired her, though. Broken and battered, she had needed a new start in life, and Mason was taking care of her immigration process. According to Adam, she ran the place like a high-end boutique hotel, supervising every aspect of the household. His phone in the charging station on the desk murmured insistently, signaling another text message from Regina. She had not taken the news of his change of plans well. She’d peppered him with all the questions he’d already run through with his brother and sister: Why did he need to come here in person? Couldn’t a staffer take care of hiring the new caregiver? Couldn’t Adam or Ivy change their plans and step in? No, they couldn’t. Both had commitments that couldn’t be broken—Adam’s training in arson investigation, Ivy’s art fellowship at the Institut de Paume. But Mason didn’t feel like getting into a big debate with Regina at the moment, and so he ignored the message. Last night he’d slept like a corpse in the comfortable guest room. It was so damned quiet here, and the air was sweet and the jet lag had finally caught up with him. “Is my mother up yet?” he asked. Are you a water person? Have you ever lived on a lake? What did you like best (or least) about it? Are you reading the books in Susan Wiggs' Lakeshore Chronicles series? Do you have a favorite? 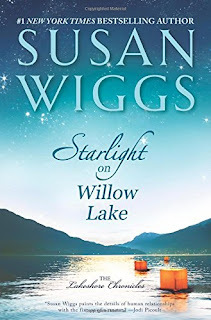 One randomly chosen person leaving a comment on today's post will receive a copy of Starlight on Willow Lake. (US/Canada only) Deadline for comments is Friday, August 14. 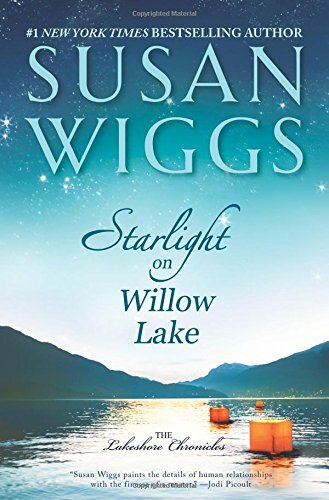 Starlight on Willow Lake sounds like a wonderful read. I can't wait to read it. I'd have to say I'm a 50/50 when it comes to water. Only time I spent any length of time was summers at a lake house. I love the Lakeshore Chronicles. Couldn't really single them out. I always love the one I'm reading at the moment. They are all wonderful reads. I've always found it very soothing. I love water during the summer since we have spent a week or two at lakes and the experience was wonderful, Great Lakes and smaller lakes. We fished, swam and loved the change of scene. I have read the series and enjoyed each of the books greatly. I grew up in the Great Lakes region. Beautiful country. I haven't lived on a lake but visited lakes when I was young during our family vacation which were memorable and yes, old fashioned and simple. Swims, boating in rowboats and fun picnics by the lake. The lakes were clear, clean and had sand bottoms so ideal for children and families. I miss those vacations. I look forward to reading this Lakeshore Chronicle novel since I did read the first one. I've spent more time on beaches than lakes, but I'd love to have a house that looks over a lake! Jill Shalvis & Lori Foster post wonderful pictures of the lakes where they live. I started reading the Lake Shore Chronicles last year so am now a fan - can't pick a favorite - looking forward to reading this next episode. I love the photos that Jill Shalvis posts! I've visited the area where she lives and it's breathtaking in its beauty. I don't live on a lake, but I do live less than five minutes away from a 35-mile lake that is a favorite site for family gatherings. Other family members enjoy fishing and water sports, but I like finding a quiet spot with a good view of the lake and a good book, especially in the fall with cooler temps and the leaves providing a symphony of color. I've been a Susan Wiggs fan since I read The Charm School in 1999. I love the Lakeshore Chronicles. Snowfall at Willow Lake is probably my favorite, but I have enjoyed them all, including this one (#11), which I will be reviewing here soon. Never lived on or near a lake but on Sundays during the summer we would pack the car and go to the beach along Lake Michigan. I love the water. I have enjoyed the whole series by my favorite is Summer Hideaway. Pamela, on which side of the lake did you live? I grew up 10 miles from Lake Michigan. Loved it in both summer and winter! I'm not really a water person, though I wouldn't mind living on a lake!! The book sounds wonderful. I am loving this series. Not an avid water lover. I have not read any of this series. But would love to try them. I do love the water. Have never lived on a lake. I am not really a water person. I did have a pool in my yard before I sold my home and I enjoyed going in it. Never lived near a lake. This book sounds really good. I've read several books in this series and enjoyed them all. My favorite is the first one, Summer at Willow Lake. I lived near a lake as a child and enjoyed swimming and boating growing up. I live near a lake now and find it very soothing. I am a water person, but not a beach person. I love lakes, ponds, rivers, streams, and the ocean. Taking a canoe out on a quiet lake or pond is a wonderful way to spend an afternoon. Canoeing down a river be it calm or with rapids, is an adventure. I prefer the canoe because it is quiet and can get into places even rowboats can't manage. The wildlife doesn't tend to be afraid and will often come right up to you. You can paddle or just lie back and drift. My family had a little cabin on a small lake in the Adirondack Mountains of Northern NY. We could swim off the dock or go to the end of the lake for the sandy beach. We could fish from the dock or go out in the rowboat or canoe. I often canoed back into the marsh area. We walked around the lake and hiked up into the mountains that surrounded it. In the winter we would clear a skating rink, walk across the lake, and go ice fishing. What I liked best was the peace and quiet. It was busy and noisy on weekends in the summer, but the rest of the year few motor boats were on the lake and there weren't many year round residents. Sitting on the dock in the early morning fog, you could hear the buzzing, splashing, and chirps of nature, but little of man intruded. It was very surreal. One could almost expect a dinosaur to come slowly from the mist on the lake. I have a few books from this series in my TBR mountain, but sadly have not gotten to them yet. I read the excerpt after posting my comment. I had no idea the setting was in the Catskills. It is south of where I grew up and not quite so rugged. Of course our little 2 room cabin was nothing like the estate which is the setting for this book. The feel of the area is there, however. I really need to finish getting this series and read it through. It will be a bit like going home. I grew up in Wisconsin in Two Rivers, a city that actually is a peninsula in Lake Michigan. It's nickname is the "Coolest spot in Wisconsin". It's located directly across from Ludington, MI. The Badger ferry travels back and forth between Manitowoc and Ludington. The water was numbing cold on Memorial Day weekends. I started swimming when I was 2. I worked as a lifeguard during my summers off from HS/college. I went to college in Madison. That city is surrounded by 3 lakes: Mendota, Monona and Wingra. After college I worked in Milwaukee. My sister's apartment was a cross the street from the Soth Shore Marina. I then moved to Racine followed by Manitowoc, both on Lake Michigan. Finally we settled on a small spring fed lake in central Wisconsin. Next year will make it 30 years. I love the lake. We are located on the eastern shore so I see spectacular sunsets. I try to swim everyday the weather allows. Winters we used to cross country ski on it. We have a canoe but no power boats. The mornings and evenings are peaceful. However, it is a waterski lake so from 10-4 I do other outside activities or I read in the backyard. In the winter I escape Wisconsin and live in Florida. There we are 5 minutes from the Atlantic Ocean. I swim in a pool because I don't like the taste of salt water and I have a strong fear of sharks. I definitely have an attachment to water! I've been reading Susan's books for years. The last one I read was Marrying Daisy Bellamy. I liked Greg and Nina's story in Dockside. I'm looking forward to reading STARLIGHT ON WILLOW LAKE.